Darren Woods, a British poker player whose largest claim to fame is winning a bracelet at the World Series of Poker has been sentenced to fifteen months in prison in connection with years of online fraud at several European-facing online poker sites. Woods, of Healing, near Grimsby in North East Lincolnshire, was also ordered to pay £1 million in restitution within the next six months, or be faced with an additional six years in jail. According to authorities, the million-pound fine represents only a portion of the money Woods stole from his victims which included both other players and the online sites themselves. 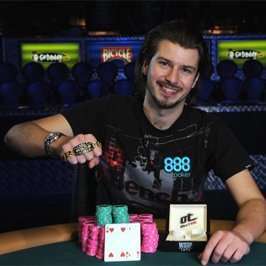 Darren Woods as he celebrated his WSOP bracelet win in 2010. The source of his sizable poker bankroll may well have been online fraud. Woods, at one time a sponsored player wearing 888Poker gear, originally pled guilty last October to charges of fraud and collusion. Widely known under his “DooshCom” screen name at 888 and other sites, Woods was ultimately charged with and convicted of opening many accounts at different sites, using multiple real-world identities. Armed with the multiple accounts and equipped with several computers and internet connections that made him appear to the networks to be logged on from differing locations, Woods then occupied two or more seats at the same table, in a form of self-collusion that allowed him to see multiple hands at once, and gain a huge edge over other players. Woods was also accused of improperly profiting from fraudulent registration into the various online sites’ loyalty and rakeback programs, garnering promotional offers through his use of alternate identities to which he otherwise would not have been entitled. Woods was initially charged with 13 counts of fraud for his activities at the unnamed site. Woods initially pled not guilty to the charges, then changed his plea to guilty on nine counts several days into the trial, as the mass of evidence against him began to build. According to published reports, the fraud accusations against Woods covered a period of five full years, from January of 2007 to January of 2012. The alleged end date for Woods’ online fraud correlates neatly with his outing as a suspected cheater by other high-stakes online pros. Back in November of 2011, several well-known high-stakes players co-authored and signed an online statement posted at 2+2, in which they accused Woods of defrauding them by employing multiple accounts at the same table. The statement included several blatant examples of suspected cheating by Woods, and the thread quickly drew a response from an 888Poker exec, Gareth “Gaz” Edwards, who announced that an investigation was ongoing. Still, nearly three years elapsed without public disclosure in connection with the allegations until his arrest was reported last fall, and whether 888 was indeed the “Gibraltar-based company” behind the allegations remains probable, though officially unconfirmed. It’s quite possible that Woods’ scheme funded his live poker career as well as his online one. After filing for bankruptcy in 2006, Woods suddenly surged on the online scene, and had the money to travel to Las Vegas and play in the WSOP, where he captured a limit hold’em bracelet (and $213,000) in July of 2010. Woods, now 29, is alleged to have perpetrated his scheme on several online sites, though news reports indicate that online one online company provided information for Woods’ UK-based prosecution. Other screen names known to be used by Woods in addition to his “Dooshcom” handle were “Dingdonk1984” and “Salamdolphie”. Several other screen names were also linked to Woods during the player-led investigation and accusations. In addition to Woods, his father also faces legal problems in connection with the online fraud. Morteza Gharoon, 56, admitted to a “money-laundering” matter, according to a recent Grimsby Telegraph report, helping move £230,000 in Woods’ poker funds on and off the site. Gharoon also let Woods create at least one of his alternate accounts in Gharoon’s name. Gharoon was given a six-month suspended sentence and agreed to a £18,910 forfeiture. Few players, of course, had Woods’ other advantages, which in addition to the now-cancelled 888 sponsorship deal also once included a coaching agreement with PokerStrategy.com. Woods’ is also stated in some reports to have dabbled on the affiliate side of the business as well. Woods has already had £911,217 in personal assets seized, with £283,673 already ordered to be returned to the unnamed Gibraltar company for purposes of victim restitution. Additional seizure and restitution efforts are in progress, and prosecutors allege that Woods has £1.4 million in assets,a good chunk of that deposited at other online sites.